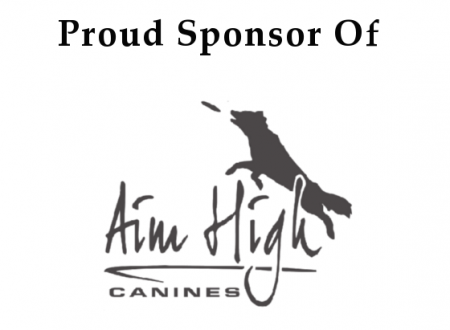 Lifetime Guarantee/ No Bones About It! 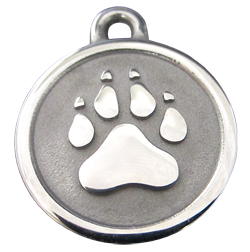 We stand behind our products with a lifetime guarantee for both our stainless steel pet id tag and the custom engraving on it. We will replace a lifetime guaranteed pet id tag, at no cost, if you are not happy with its performance. Under our lifetime guarantee, if you ever have a problem with your engraving, we take the tag back and engrave it all over again at no charge. Our lifetime guarantee allows you to ship your tag back to us if you need to change your address or phone number. For this service we have a nominal fee charge of $8 for small/medium tags and $10 for large tags, plus $2 for shipping. Please note this guarantee does not cover lost tags. Please notify us by phone or e-mail with any problems or dissatisfaction. We will promptly respond! 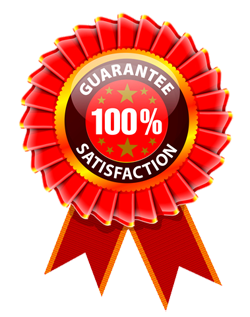 Our lifetime guarantee is the most important aspect of our product and we take it very seriously! In the event of an issue with your tag, please notify us via email or phone. Kindly ship the problem tag back to us in a SECURE envelope with the following information. on the other side. Another company, the tag was so small and the metal used so soft, the tag was wearing away after only 3 weeks. I’ll spread the word about you over here on this side of the country (Seattle). Just wanted to comment. My husband and I purchased two of your tags for our dogs when we visited Maine to attend the lobster festival. Our two dogs, Otis and Lucy both passed away within the last 6 months. I took the tags to a jeweler and had a sterling silver bracelet made using the tags. We are starting a new family with two new puppies. Tessa’s ID tag arrived today and it is really beautiful. I love the craftsmanship. I know it will hold up to our Danes ruff and tumble life better than the ones we have purchased before. I will give your brochure to my daughter for her dog. I know she will want one! I just won a Silver Paw Pet Tag from a drawing done at the Fryeburg Fair. 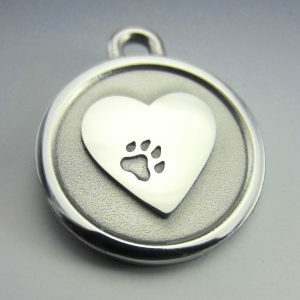 I am having it engraved to read…FOREVER DEDICATED TO MY 4 LEGGED FURRY ONES. This one is for me. I bought one last year for my dog and I love it so much I wanted one for myself. His has really held up well. The engraving has not worn off. 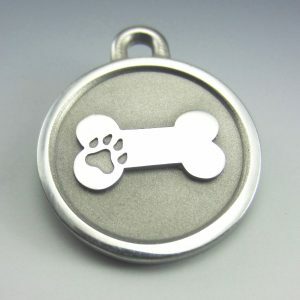 It’s a very durable dog tag with a classy style. So glad to know such a quality product can be found so close to home.